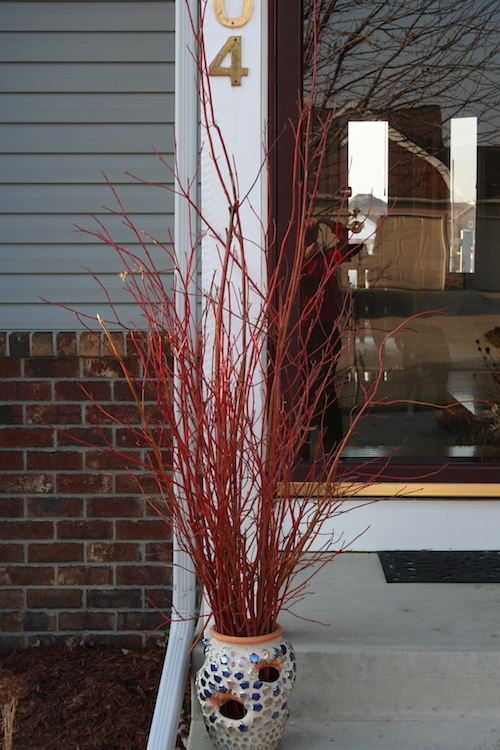 Red twig dogwood harvested from the yard and a tall pot is the ultimate cheap holiday container. Here’s the ultimate cheap holiday pot: It cost nothing. A couple of weeks ago, I trimmed back some decidedly overgrown red-twig dogwood bushes. While many of the branches went to the county brush pile, I picked some of the longest, straightest, and brightest for use in outdoor holiday decorations. For this simple pot, I took a good-sized bunch of branches and set them in a strawberry pot that otherwise would spend the winter in the garage. Ta-da! A decorative holiday pot.